Elaborate open fretwork grill, brackets, and overlay combine to make a stunning mantle clock for your most formal mini parlour. 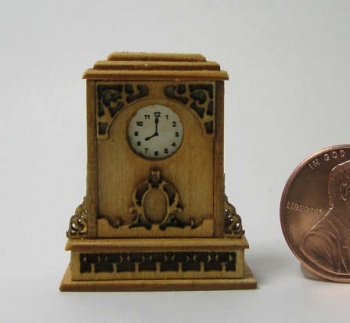 Kit includes laser cut wood parts, laser engraved clock face, instructions for assembly. Can be painted, stained, or varnished. Tools needed - Xacto knife, emery board, white glue.